Two sister dailies have backed a regimental museum’s bid to raise £300,000 over the next three years. 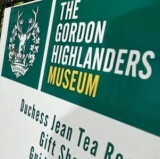 The Aberdeen Evening Express and Press & Journal have lent their support to the Gordon Highlanders Museum’s appeal, which has been launched to mark the attraction’s 20th anniversary. The appeal comes after what the museum has called a “dramatic” drop in profit and income, which has put its future in doubt. The attraction chronicles the 200-year history of the regiment including its beginnings, through to the Napoleonic Wars and both World Wars, and also featured displays on the Gordons’ links with Gurkhas and volunteer militia. Press & Journal editor Damian Bates added: “The museum remains a vital link to remember those sacrifices and is essential to ensure that today’s generations and those to come never forget the impact the regiment had in this part of the world and the efforts of those very brave men. “None of us should allow this museum to falter; it would be an absolute tragedy should it fold. “We will do all we can to protect the legacy and this financial donation shows our ongoing commitment to the history of the North-east and its people. !